This is another book that almost fell victim to an overcrowded TBR and returned to the library unread. Part of the reason I almost gave up reading this was because this was a March Group read for a group on goodreads. I have never done a group or buddy read for that matter, and I was under the impression that we had to be at the same point in the book at the same time. The other and more embarrassing reason being that I thought because I had seen the movie that reading this could wait. I was sadly mistaken. I loved the movie but there were a lot of differences in the content and obviously the writing that I would have missed out on. When I finished reading the story I re-watched the movie. In comparison now, the movie looks like a bunch of scenes stitched together with less flow. It also felt rushed. 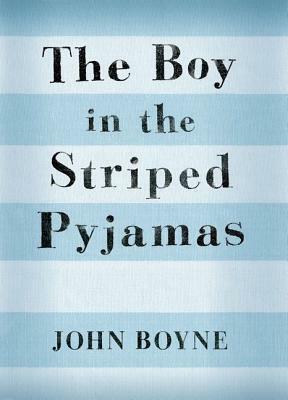 I will give the movie this, the one scene that always crushes me is when we are first introduced to the boy in the striped pyjamas. I didn’t get the same reaction when I read it. It’s still heart wrenching, but I feel it more when I see the kid on the big screen. This is the story of an unusual friendship between two boys, one German and one Jewish during World War II. We begin with 9-year-old Bruno coming home and finding out that his whole family is moving because his absent father has a new job. He hates his new house because it only has three floors and it doesn’t have a banister for him to slide down on. He believes that his father must not be very good as his job if they made him move to such an awful place. He believes that all he has to do is voice his displeasure and they can all pack up and go back home. Bruno was overly protected by his mother and other adults and he wasn’t told where they were or what his father’s job entailed. His perspective of what was going on was naïve and immature. When he meets the boy in the striped pyjamas, Shmuel, he has no idea why Shmuel lives behind the fence. This is where the lack of maturity is the strongest. There is nothing inviting about the fence. Everything about it screams cage or prison. Yet to Bruno it’s just something that’s in the way. Bruno invites him to dinner and makes plans to have him over for the holidays when “this is over”. This is where I come to the story and I have to pause for a minute. Two thoughts follow me for the rest of the story. Firstly, I know this is a fictionalized story about these two boys but I can not help but think that Shmuel represents countless other boys whose stories will remain unheard. Somewhere deep down inside where my feelings aren’t so easily described in words, I believe that if this had been a story of just this one boy, that this was a gross error in one of the most horrific events in our lifetime, and just this one boy was hurt, that maybe we could wrap our head around it and for the lack of a better phrase, not hurt so much. Sadly there were more Shmuels and this is a thought that I cannot shake. I love the way the story is told from Bruno’s perspective and how his innocence and the common sense of a 9-year-old frame his observations. Even though they are both the same age, Shmuel appears to be the more mature boy of the two. The second thought that follows me – Is this such a bad thing? That Bruno is ignorant of what’s going on? What’s the alternative? That at a young age his parents should have sat him down and explained to him why they kill Jews? I cannot imagine anyone getting to the last few chapters and putting the book down. It’s more likely that you’ll call in late to work or take public transportation instead of driving. I initially rated this 5 stars, but after some reflection, I felt I had to lower it because the scenes that I felt the most I was recalling from the movie, not the book. I gave it 1 star for its attempt in getting a story of a horrific event in front of young readers. That’s a good thing, isn’t it? Recommended even if you’ve watched the film. They are different enough to warrant reading this emotionally manipulative fable*. *This is a Get Out Of Jail Free Card for historically inaccurate pieces of fiction. P.S. I’m glad to be done with this review – every time I started writing it or called up this book on goodreads, I’d type The Boy in the Plastic Bubble Ughh! Great review! I’ve also seen the movie and really liked it so I’ve been hesitant to read the book. Looks like I need to add it to my list. ? I totally understand avoiding this theme. I am fascinated that this occurred. That we could do this to one another. Bruno’s ignorance to what is going on plays a role in his friendship with Shmuel and some reviewers weren’t buying it – that he could be that naive. Then you read survivor accounts recalling how there were people on both sides of the fence that were ignorant of the fact or just plain refused to believe what was going on. Oh, Danielle, I hope you like it. If you haven’t watched the movie, and you’re in no hurry to watch it, then I would suggest reading the book first. That way you can judge the book on its merit (unlike me) – I’d love to hear what you think.